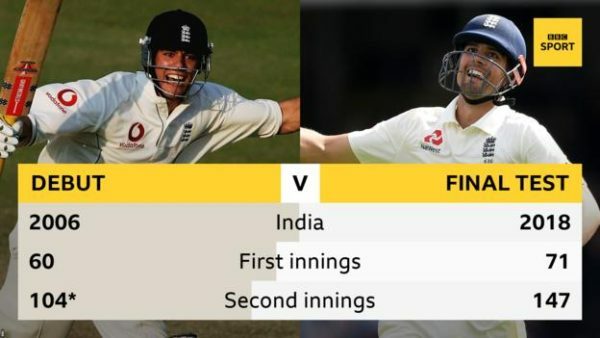 England v India: England took complete control of the fifth Test against India on an astonishing fourth day at The Oval in which Alastair Cook signed off with a century and James Anderson equalled the record for Test wickets as a pace bowler. Anderson then drew level with Australian Glenn McGrath’s pace bowling record of 563 Test wickets as India, chasing an improbable 464 for victory, floundered. It was a historic day all round for Cook, who surpassed Kumar Sangakkara to become the fifth-highest Test run scorer – and most prolific left-hander – before reaching his 33rd and final Test century. 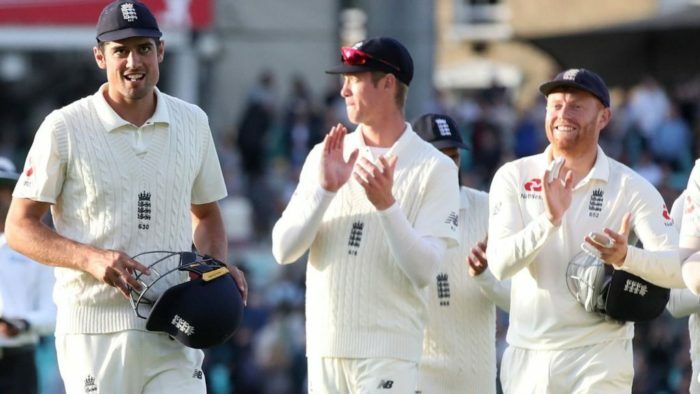 The crowd chanted Cook’s name throughout the final five minutes of the day, and the team applauded the fans as they made their way off the field at the close of play. It was a day filled with ‘where were you?’ moments – and it has put England within touching distance of an emphatic final-Test victory. Cook has not looked fluent at times in this series but, resuming on Monday on 46, he showed flickers of the player who for so long has been the backbone of England’s batting. Cook’s century came up in farcical fashion – on 96, he pushed and ran for a single, but a poor throw from Bumrah went for four overthrows, and took him to 101. He was embraced by Root and received a second standing ovation of the day – eventually having to ask the crowd for calm so play could resume. Much as Cook has done with the bat, Anderson has spearheaded England’s bowling both home and away for the past 10 years. Cook and Root’s partnership, as well as some late hitting from the middle order, kept India in the field for 112.3 overs, and Anderson was able to exploit their scrambled minds when the tourists came out to bat. It seemed inevitable that on such a dramatic day India captain Kohli would be the wicket to take Anderson past McGrath’s long-standing record. The Oval once again got to their feet as they, and England’s slip cordon, seemed convinced Anderson had trapped KL Rahul lbw, but a review showed the ball was going over the top of the stumps. Anderson, as much as he strived, could not find the wicket to take him past McGrath’s record and add to his tally of 23 wickets in the series so far, and will instead hope to do so on the final day of the match – and series – on Tuesday. If Cook’s century was a farewell, then Root’s was a welcome return to form ahead of the winter tour to Sri Lanka in November. “It has been one of the great days of English cricket. For Alastair Cook to find that rhythm with the bat in hand, after the emotional rollercoaster he must have gone through this week, is remarkable. “We have watched him for 12 years but that innings was up there with one of his best. England’s Alastair Cook, speaking to Test Match Special: “It was an unbelievable way to end. It was strange week but I was just determined not to get out early because it would have been an anti-climax, but to go out like that is the prefect way to end. “I don’t think there was any doubt I could still play but I certainly found the last 12-18 months harder. “My greatest skill is to be able to take a lot of emotion out of my batting and to be able to take one ball at a time, and if there has ever been a test of that, it has been this week.